With the influx of online marketing and decline of printed marketing material, you probably think that print is dead but print is actually very much alive, particularly for business owners. 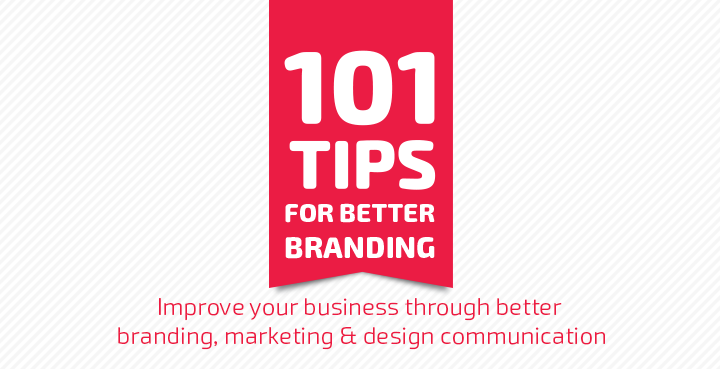 Any and all businesses will at some point have something graphically designed and printed to promote their business. 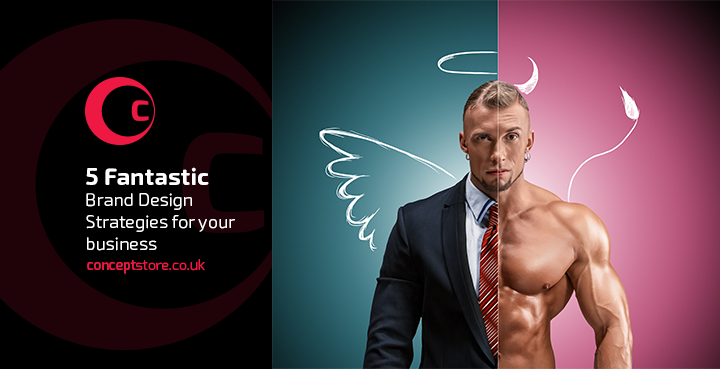 It might be a business card, a brochure, some signage or an advert and in any case, you’re going to need to speak to a graphic designer to get the job done. This can be a minefield to understand, so I’ll try and keep it simple. Resolution is basically how much detail an image has, measured in pixels per inch. The more the better, however, this is irrelevant unless you take into consideration the actual dimensions of the image as well. Graphic design and printers work in real dimensions such as mm and inches and computer screens do not, they work in pixels. What seems like a huge 30cm x 30cm image on your screen may only be a business card size image in real life. That’s not helpful if your printing an A4 brochure. 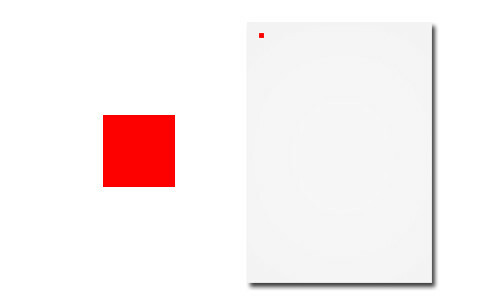 To the left is a 1inch x 1inch (72px x 72 px) box at 72ppi as it would appear on your average computer screen. To the right is the exact same box as it would appear on a full size 300dpi a4 letter. For professional print you need hi-resolution images, usually ones which are either a vector design or a design with a minimum 300dpi (dots per inch) file for best quality output. This may sound like jargon but as soon as you order print, that’s what your printer will ask you for, a design file of 300 dpi. This is one of my favourite techniques. 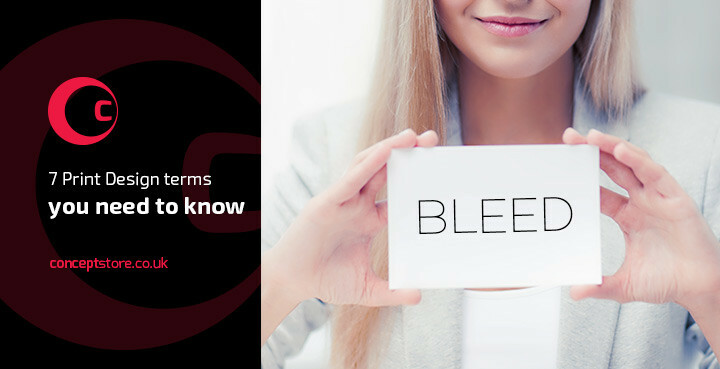 A bleed edge is where the ink/design will run right to the very edge of a document page, giving the impression that it was printed from edge to edge. The truth is that it was printed past the edge of a bigger sheet of paper and then trimmed down to size so the ink/design really is edge to edge. Most home based printers and software cannot accommodate a bleed edge, its only graphic design apps and pro printers that can do it. To sum up how it works, you take your basic document size (A4, 297mm x 210mm) and extend it according to the printers specified bleed dimensions. 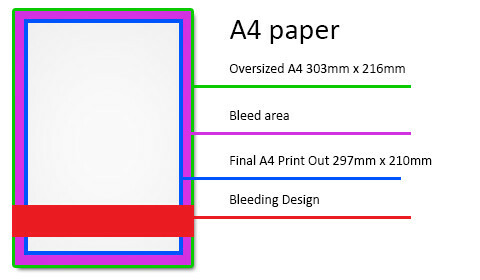 If the bleed edge is 3mm then you add 3mm to every side of the A4 document making it 303mm x 216mm. The printer then prints the document at the bigger size and then trims it down to the original A4 size. Bleed is a great design technique allowing much more creativity and style to any document. Its something you should know because your print design will probably have one and your printer will specify the bleed edge measurement that they need. For a font to be usable on a on a computer, it needs to be bought, licenced and installed on that PC. 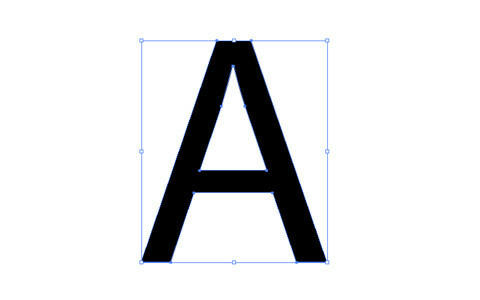 If a designer has and uses a font for a design project and sends the design file to the printer then the printer will also need that font in order for the design to display correctly on their computers. Without the font, the design file would use a substitute font and change the final design. The substitute font may look different to the original, it may be a different size or style and with this change it may cut off some text or change the formatting. To sum up, the end printed result would not be the same as the final design file because the font changed. Rather than sending masses of fonts around from designer to printer or illegally using unlicensed fonts, a printer normally asks for all fonts to be converted to outlines. This is the process of turning text into graphical elements. In doing so the text becomes a pure graphical element rather than a piece of text (letters and text are glyphs after all). This means that printers and designers do not need to share the same set of fonts and it also minimises the chance of anyone accidentally making a typo to the finished file because the text will no longer be editable as it’s now a graphic. The eye uses RGB (red, green, blue,) colour cones to mix and reproduce the colours we see. Screens use the same RGB colour profile to create colours but with limited capability (16 million colours). 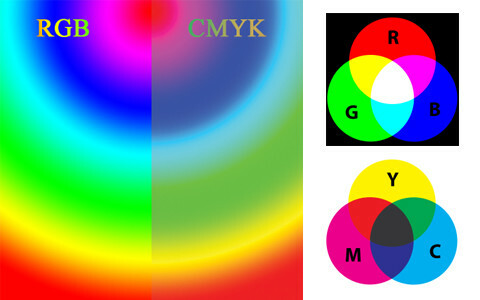 Printers use CMYK (cyan, magenta, yellow and black) to produce colours. These different measures of mixing colour produce different results. If you have a blue web graphic on screen (RGB), note that it will look different (light navy, almost purple) when printed professionally by the CMYK process. Only professional design software caters for design in CMYK format and that’s what your printer will request when accepting a design file. 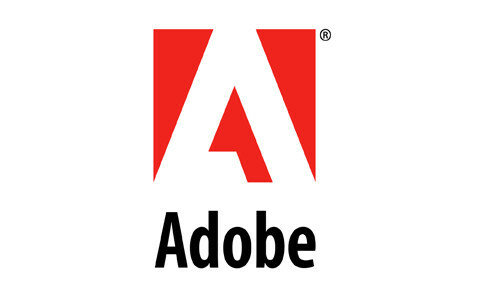 Adobe is the leading creative software provider in the world. Their software and file formats are industry standard for print design and printers (and web). You need to know the name because you need to know about their file formats as both designer and printer will use them to create and print files. Printers don’t accept MS word or Publisher files for professional print because they’re pieces of software intended for screen usage or home printing. Software like this cannot manipulate resolution, colour profiles, or design techniques so you’ll need to know what file format designers and printers use. .AI, .PDF, .IND, .EPS and .PSD are some of the most common file formats that printers accept. 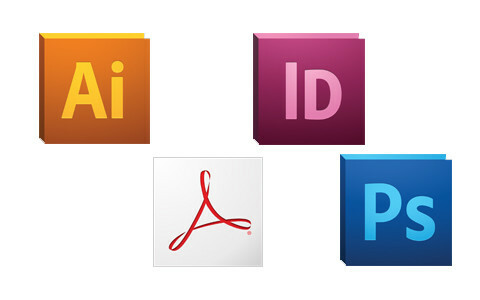 All are file formats created by Adobe and it’s what your designer will use to create or setup a design file for print. .ai -Illustrator is a software program used to create vector graphics (primarily logos and illustrations). Vector graphics use mathematical equations to draw graphics and in doing so, create a graphic that can be resized to any size without distortion (eliminating file resolution problems). It’s a valuable file. .psd – Photoshop is probably the most popular design software to use and hence why you’ll probably come into grips with one at some point or another. Used for everything from photo editing and graphic design to illustration and web design. 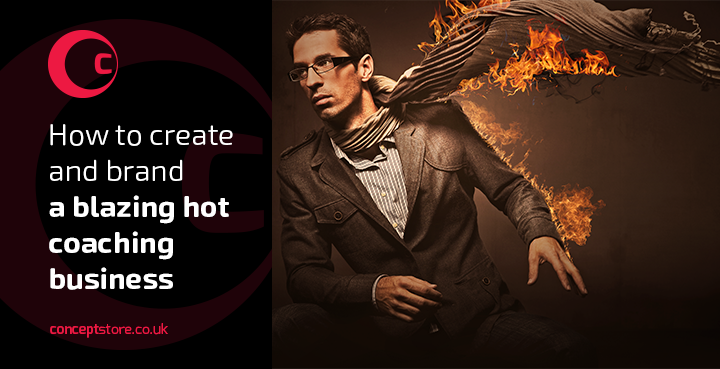 .indd – Indesign took over from quark as the leading layout and publishing platform. Its mostly brochures, magazines and books that use this program but anything can be laid out on this software making it a popular choice for print. .pdf – Has become the universal standard for file handling. Any of the above software programs can reproduce a print ready pdf and all printers happily accept them as their preferred, print ready file format. 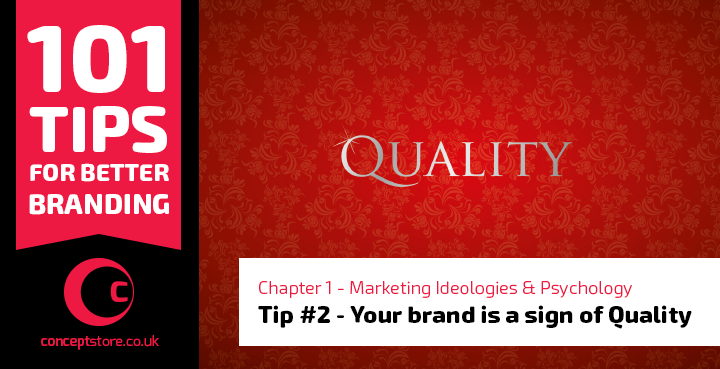 Design – Always factor in design whether it’s from an independent designer, a studio or the printers in house graphic designer. 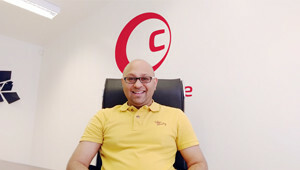 Quick turnaround – Some printers offer priority service for quick turnaround but this is not always true. Take into account that the turnaround will still involve your proofing, your printers acceptance of work, their own production schedule and then their delivery schedule and overall turnaround. A priority service could actually be a 5 day wait.